Over the weekend of June 26-28th "Crazy" Ian and yours truly, the Bigfoot Bookman, traveled up to Bluff Creek to investigate the Patterson-Gimlin bigfoot film timeline and film site. Many strange occurrences were encountered along the way, including the sighting of one of the largest black widow spiders ever seen in Ian's SUV. Unfortunately, those hundreds of cute baby spiders that had hatched from their egg sacks on the way up to camp were suddenly NOT so cute. The truck will have to be fumigated. After a stop at the desolate Aikins Creek Camp-ground we headed up to Fish Lake for the night. It was crowded, and the only wood knocks and vocalizations heard were from the homo sapiens infesting the place over raucous campfires. The road up was perfect, save for a little dusting from this winter's mudslides. The lake, despite the crowds, was wonderful, half-covered in lily pads, the other half with fishing boats. Having survived the spiders and humans, we headed down to the Orleans diner, and then up to the film site. Along the well-graded (compared to past years) 12N13, one of our cars (a Volkswagen Golf--NOT recommended!) lost its oil pan. Undaunted, we made our way down the "K-Spur" (count the pull-off spurs from 12N12, three on the right, one on the left, and the "K" is the fourth right, head downhill, not sideways). This rugged, often wretched, road is not to be traversed save in a truck with high clearance, preferably 4WD, and one that you don't mind getting all scratched up. The rockslide and marsh mud at the bottom were easily traversable That said, it was easy! But get the book-bound USFS topo atlas. COPTERS! Yes, it was just like something from the Art Bell Show, or a paranoid right-wing conspiracy. Immediately upon arriving at the creekside we were buzzed twice by a black, apparently unmarked black helicopter. What strange things could the Men-in-Black be up to on the P-G Film Site??? After observing us it circled back and actually landed on the gravel bar on the west end, more or less where the Patterson film begins. Checking ourselves for anything illegal, we headed down through the bracken forest to the site a few hundred yards to below to the east. Down there we met several guys who were not space aliens or covert agents, but from National Geographic's TV division. They were filming the site and scanning the topography of the environs to document and confirm the location. Look for their upcoming Bigfoot documentary to contain a first-generation copy of the film scanned at Patty Patterson's home in Yakima, WA. Each frame has been scanned at mega-high resolution, uncropped. They were not exactly sure they had the exact site located, as they had two GPS coordinates. Investigation, though, found pink plastic tape markers pretty much exactly at the start and finish of the film creature's course. They asked what we thought, and seemed well enough convinced of the Titmus-Dahinden-Perez connection for locating the film, not to mention the word of Bobo Fay and other next-generation squatchers. An aside mentioning of M.K. Davis' downstream location theory was not, however, appreciated. noitered the area, upstream and downstream, and were able to get a good feeling of the possible track course, despite the amazingly thick alders and overgrown understory now covering the once nearly barren sand bar. (Time for another flood?) Problematic, however, is that an unobstructed view of the background trees is not fully possible, and several landslides on the north side have taken out many of the potential identifying older trees. Having recently been privy to a report of a cryptid (mythical?) GIANT SALAMANDER seen by M.K. Davis while guided by Don Monroe, we tended to have our eyes out for such a thing. This sighting was in a pool in Bluff Creek right around where Notice Creek enters it, near Louse Camp. M.K. said it was around three feet long! As we proceeded downstream in rubber boots, under and around tremendous knots of wood bracken, roots and trunks, we came to a small shore-side pool where something was seen. Looking closer it was about a foot long. It was a Giant Salamander, for sure. Having once caught a terrestrial Pacific Giant Salamander, I tried to grab this one; but it was amazingly fleet, and swam away rapidly like a fish. We obtained photographs, and noted small gill fans at the sides of its head. This was an aquatic salamander in a neotenic state. 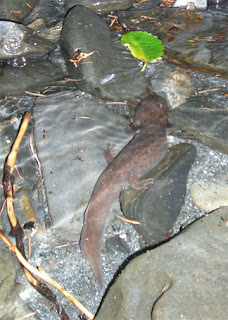 Check this species out on Wikipedia: http://en.wikipedia.org/wiki/Pacific_Giant_Salamander. Our guy appears to have been one of these, a sub-species: http://en.wikipedia.org/wiki/California_Giant_Salamander. Or... could it be just an infant state of the REAL BIG ONE that M.K. saw, and that has been told of in legend? Many believe these giant ones DO exist here, much as they do in Asia. As the day waned we headed down 12N13 toward Louse Camp for the night. 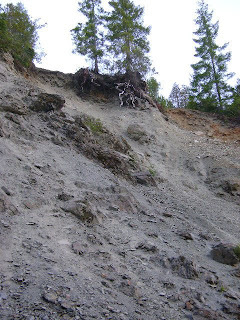 However, about 1/2 a mile up from the camp there is a HUGE LANDSLIDE. So, BE FOREWARNED, take the southern Onion Mountain route to Louse. Just around the bend from the Notice Creek drainage, this slide has covered the entire road quite deeply, with the massive collapse going all the way up to the top of the ridge, including huge boulders and many trees. Given the current state of government we seriously doubt this damage will be corrected any time soon. It would require the reinforcement of the entire mountainside, not just a plowing--it is that thick. Only an ATV could make it over that hump. If you plan to camp there you will have to walk in--no easy car camping. IMAGES: by Steve Streufert, June 2009, save where noted. 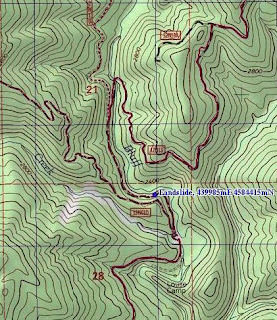 The topo map below is from Ian's cool GPS unit, which got a good signal all along the way. After a fine night at BEAN'S CAMP, just across from the 12N13/Cedar Camp junction and down the hill a bit, we headed back to get the car towed. Amazingly, there was a cell phone signal up at the top of the film site road! This enabled Buddy's Towing to come all the way up from Willow Creek to tow us out, over sixty miles each way, over dirt, gravel, river, hill and dale. It was a fine trip! But no Bigfoot sightings were made nor evidence found. In a way, we didn't NEED that! IMAGE: Patty cruising the Film Site, October 20th, 1967. From the publicity photo distributed originally by Roger Patterson with his book, "Abominable Snowmen of America: Do They Exist?" If you are heading up to Bluff Creek, be sure to check with the Forest Service about road conditions. And ask the guy in the Willow Creek office to sell you a Klamath-Trinity/Six Rivers Forest Atlas, which he normally keeps hidden in his desk. He knows some great Bigfoot sighting stories, too. Regarding the timeline: There seems to be no way P&G could have taken the rugged Bald Hills Road in the given time frame. We're with Perez on that one. Also, given that road conditions in 1967 were probably not as amenable as today, even the route through Willow Creek is problematic. It is a long drive. 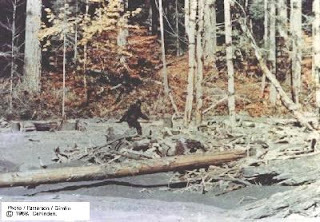 It is impossible to determine what their time would have been without knowing the state of the roads, the capabilities of Gimlin's truck, and not even knowing exactly which route they took to get down from the film site. These factors need to be determined. Could the roads have been BETTER in those days? Seems unlikely, save for the road going up to the filmsite from Louse Camp. On top of this, the post offices out here close at 5:00, so there is no way they could have used the Eureka USPS (assuming similar business hours, assuming Al Hodgson is right about the post office, and not the Murray Field airport being the sending site). They could have mailed it in Willow Creek, as some such as Long have suggested, but the mountain mail truck these days leaves here at 3:45. We assume a similar situation back then, but just can't be sure. The distances, too, are just too great, in our humble opinion. You can check this on Google Maps: just enter from "12N13" to Eureka, CA, the rough parameters of the trip. You'll get a result of: "102 mi – about 2 hours 43 mins." Or try this, for 12N12: http://maps.google.com/maps?f=d&source=s_d&saddr=For+Route+12N12,+CA+00049&daddr=Eureka,+CA&hl=en&geocode=&mra=ls&sll=41.10871,-123.895005&sspn=0.731548,1.487274&ie=UTF8&ll=41.097982,-123.895569&spn=0.731663,1.487274&z=10 . How DID they do it, and get back shortly after Al Hodgson's 6:00 store closing time? WHY would they even need to fudge the timeline, if they did? There was no real urgency beyond excitement, and nothing (we assume) to hide. So, just as with the exact film site location, the timeline too has large factors of indeterminacy, even at times impossibility. What we are left with is an often conflicting bundle of stories and and later recountings, memories muddled (we all remember and see differently, and don't exactly record everything in daily life accurately for later reference) after 41 and a half years (no, I am not bunking Bob), and each book that comes out only seems to ADD further piles of inaccuracy to them! What do we know for sure, and what are we simply guessing at? Why do so many researchers differ in their conclusions about something so simple as taking a minute of footage and driving it to town? THIS needs to be analyzed. Without a clear timeline there will only be further compounding of errors, and this leaves room for debunkers to step in and call the whole damn thing a hoax. Where there are gaps in the information there is room for conspiracy theory, or dismissal. Want to learn more about the Patterson-Gimlin bigfoot film? Visit this great site for an historical survey: http://pattersonfilm.com/. See the awesome M.K. Davis b&w stabilized version of the film on this link: http://www.bigfootencounters.com/files/mk_davis_pgf.gif. short of going there my self - this is a great way to learn more about the location. I feel like I have been ther my self. Jon from Michigan. I am planning a trip out this March/April, been there 7 years ago but never found the site. Hoping for a better result this time. NOTE: the roads might still be closed then. May not open until June. Anyone wanting help can contact me via this blog. I can show you the way to the site. Bring a 4WD vehicle with high clearance, though! "BLACK HELICOPTERS! Yes, it was just like something from the Art Bell Show, or a paranoid right-wing conspiracy." Funny how times have changed. 'paranoid right wing conspiracy'. I remember growing up in the 60s and back then all the way through the 80s, it was the left wing which had a monopoly on paranoia and conspiracies. Just look at all the films made then. Now, it's the right which fears the police and the feds, 'The Man' 'Fuzz', 'Pigs', as they were known to the Left. Ah, how the times change. Well, it keeps things interesting. Funny how one side always supports authority and the other dissents. The faces change, but the fight remains. The site upstream a couple of hundred yards from there where the helicopter landed has been confirmed beyond any doubt by Bluff Creek Film Site Project. That is all covered here on this blog in more recent articles, links found on the left hand side. The National Geographic documentary crew were on the WRONG location, but proceeded to scan it with LIDAR anyway, and use that in their show.